This is not decor for a kids’ table, so reserve this one for teens and adults, and get oohs and ahhhs from the surprise right before dinner is served! Read on . . . if you dare . 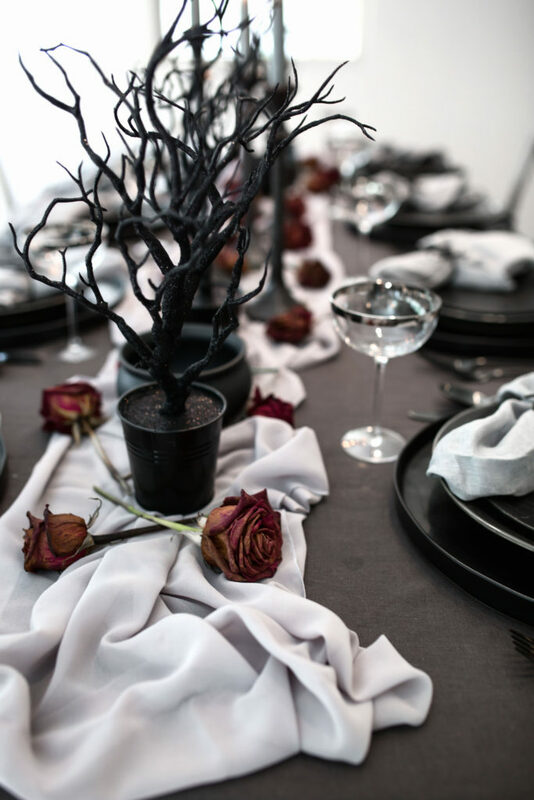 . .
My obsession with dark plates continues here with this spooky tabletop. Using matte black, rimmed ceramic chargers, layered with charcoal dinner plates and then topped with a spider web salad plate creates my favorite stacked effect for dinnerware. 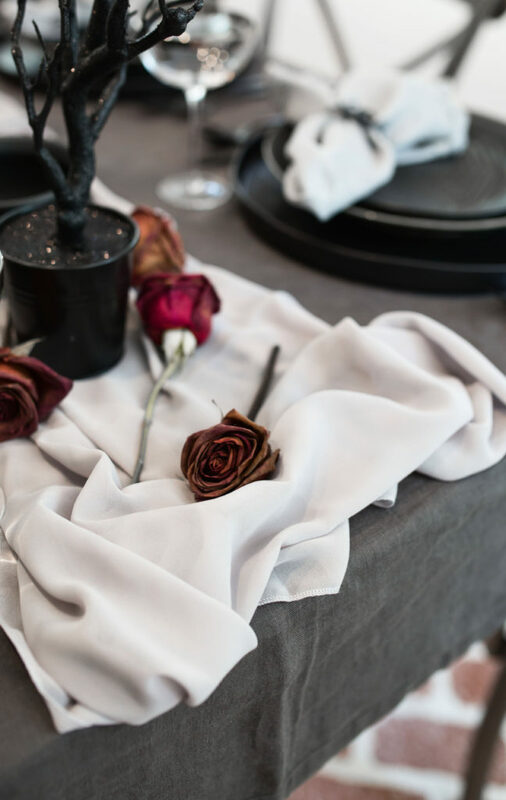 Slightly wrinkled, ruffled gray linen napkins lend a weathered, vintage touch while sleek, black steel flatware keep it modern and current. A retro coupe martini glass finishes the look. How ideal is the metal spider napkin ring that sits patiently on her web waiting for her next victim?? I found these on Amazon for a very reasonable price – such a fun addition to this seasonal table. 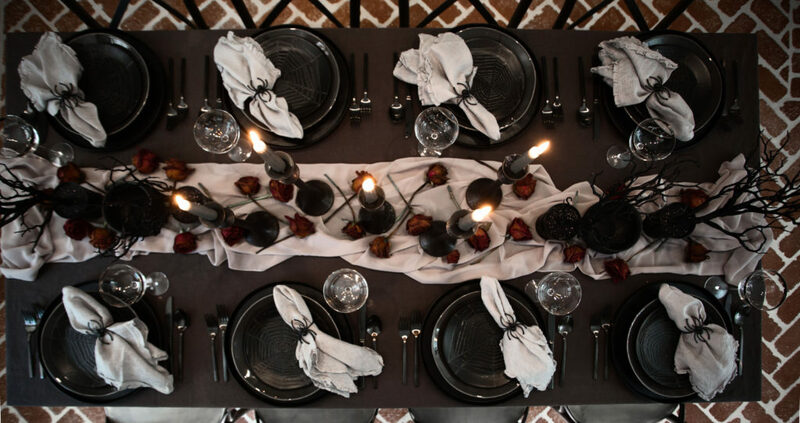 Trusty as ever, my charcoal tablecloth laid the foundation for this tablescape. 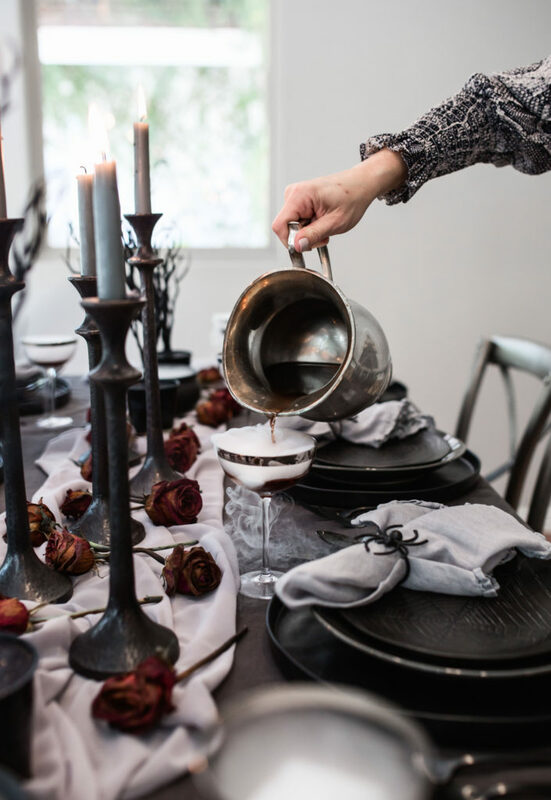 I found the smoky gray chiffon table runner on Amazon for $15 and simply scrunched it up down the center of the table for a muddled look to mimic fog in a cemetery. What could be more representative of a cemetery than charcoals and grays? Would you believe I found these desolate trees from the dollar section at Target? I will definitely reuse these for haunting decor around my house once this dinner party is over. And the roses? Yep, they’re real, but really dead. I purchased these 2 weeks before the party and simply let them wilt. Once they started to shrivel up, I moved them to a cool place and let nature do her thing. They turned out perfectly! Black glitter trees from the dollar section and real roses that I wilted myself kept the decor cost to a minimum. Your guest will always notice when you go the extra mile to create something super special. Here are few ways to add that little detail that draws attention. Pre-light your candles so they are drippy, look worn and have wax clumped down the sides – new candles don’t have that same feel. I melted these for about 2 hours beforehand. 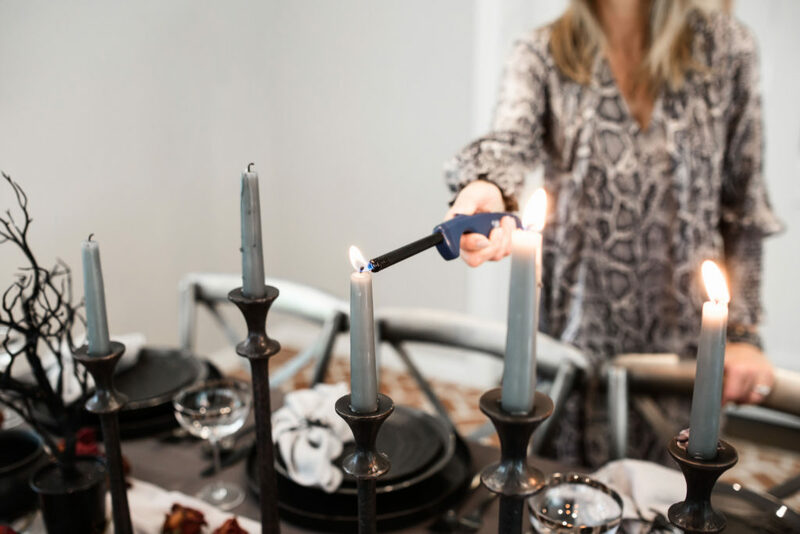 Do a test run on your candles the day before your event so you know how long to let them burn down. 2. Dry ice. Never gets old. Even with adults. There’s just something so magical about the fog coming off a glass or bowl that you’ve poured liquid on. It melts fast, so do this step right before you serve dinner! Pro tip: You can find dry ice at most large scale grocery stores. Bring a small cooler to transport it. Never touch with your bare hands – use tongs. For this party, we broke the dry ice into smaller pieces in the sink and placed in each glass after pouring the liquid. It should sink to the bottom and stay there. Dry ice should not be consumed. Surprise your guests with this dry ice cocktail (or mocktail) for an unforgettable element! 3. Chairs that reflect your setting. 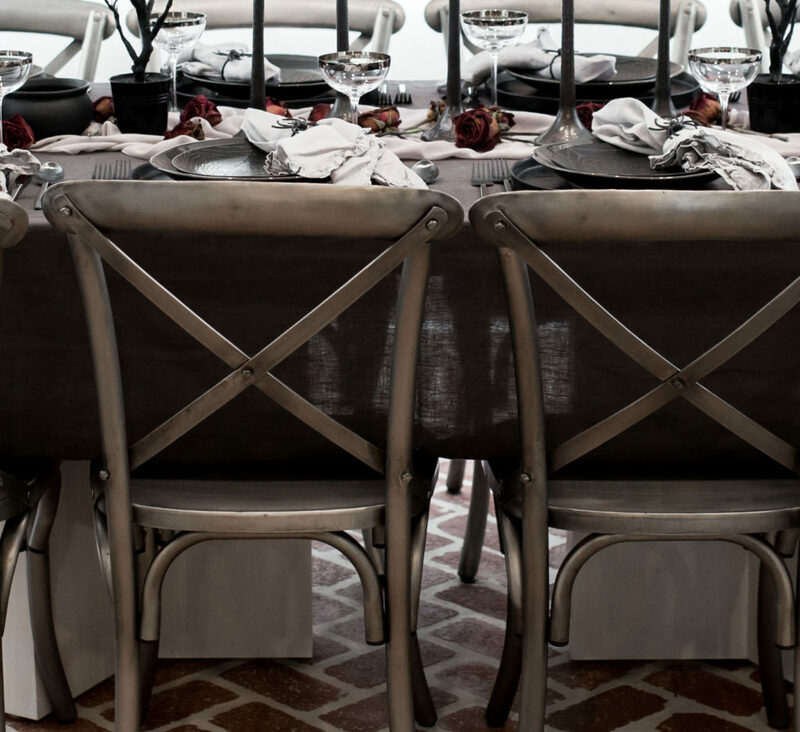 I borrowed these from a friend – my bright white chairs wouldn’t have fit into my scheme. I love how the brushed gunmetal looks against my dark table. 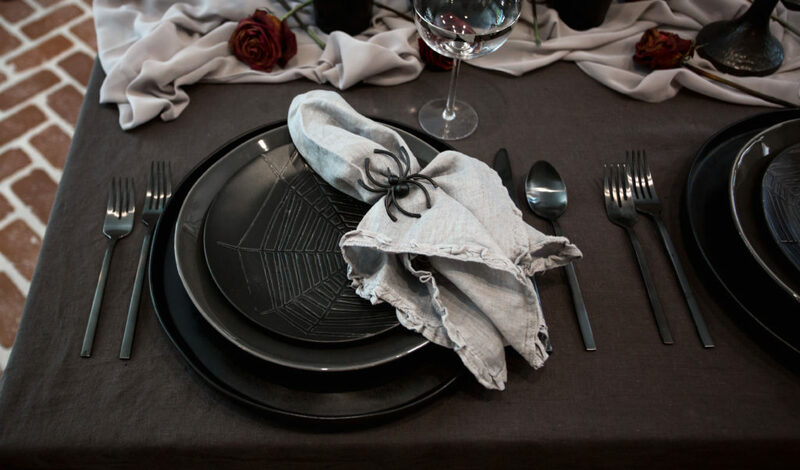 For an elegant starter, try this Coconut Curry Butternut Squash Soup with a spider web design. 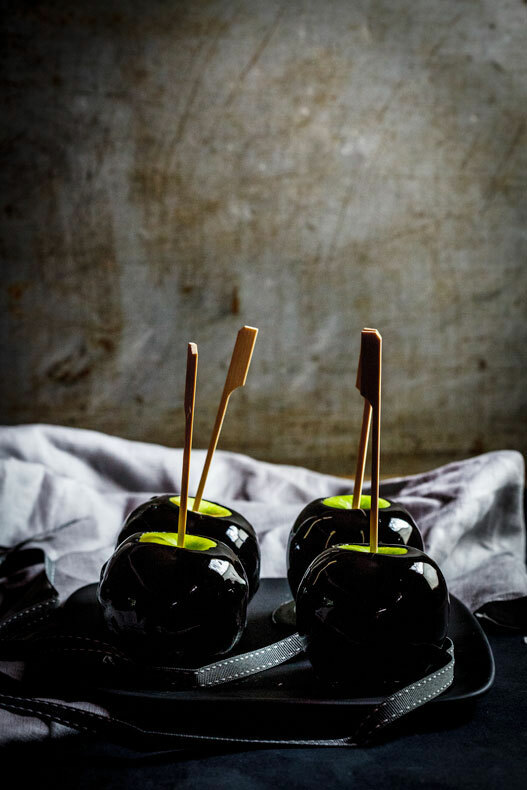 End your night with these ominous Poison Toffee Apples. 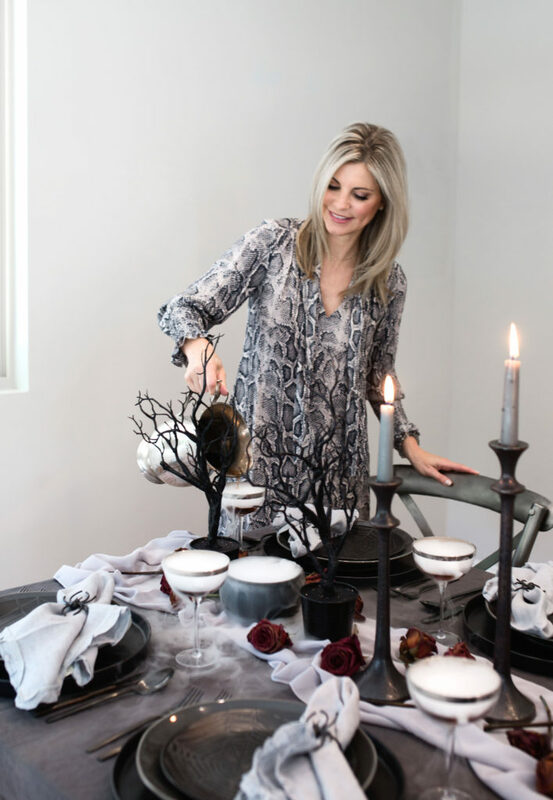 What I wear is important to me – I like to fit into my table decor without clashing and I love a good party outfit to get me in the mood. Of course, gray blended perfectly, and with animal prints on trend this Fall, I chose this python-print shift dress with gathered cuffs and a neck bow tie. This is so fun Lory!! I love the dark vibes! !